Frequently Asked Questions What is Samahan? Samahan is a 100% herbal preparation based on Ayurveda principles. It contains the extracts of 14 herbs mentioned in the sachet, only.The formula was developed by a panel of Ayurveda practitioners. The formula was developed after 5 years of Research and Development by a multi-disciplinary team of scientists, technologists and Ayurveda practitioners at Link Natural. What's so special about Samahan? Samahan is the first Ayurvedi 100% herbal easy-to-use preparation in the market for colds and cold related symptoms and Flu. When should Samahan be taken? Samahan can be taken at any time. It is most effective when taken at the first sign of cold or flu. Can Samahan be taken while on other medication? Yes. Most ingredients in Samahan are commonly used in our day-to-day food.According to the panel of Ayurveda practitioners who developed the Samahan formula, it could be taken while on other medication. If its an Ayurvedic formulation, how can it be instant and so effective? Ayurveda is a medical system that is in existence for over 5000 years and used by millions of people. Samahan formula was developed based on Ayurvedic principles and experience.The use of authentic raw materials of right quality and the scientifically optimized production protocol by Link Natural, make the Samahan effective and instant. When should Samahan be taken? Samahan can be taken at any time. It is most effective when taken at the first sign of cold or flu. Can Samahan be taken while on other medication? Yes. Most ingredients in Samahan are commonly used in our day-to-day food.According to the panel of Ayurveda practitioners who developed the Samahan formula, it could be taken while on other medication. The common cold is probably the world's most widespread malady and responsible for the loss of millions of working days. Cold related health problems are aggravated by changing weather patterns and certain allergens. Sneezing, runny noses, itching eyes and sore throats are the first signs of a common cold. ink Samahan, a 100% authentic herbal formulation that is available as instantly soluble granules that comprises extracts of 14 medicinal plants used in Peyava formulations. 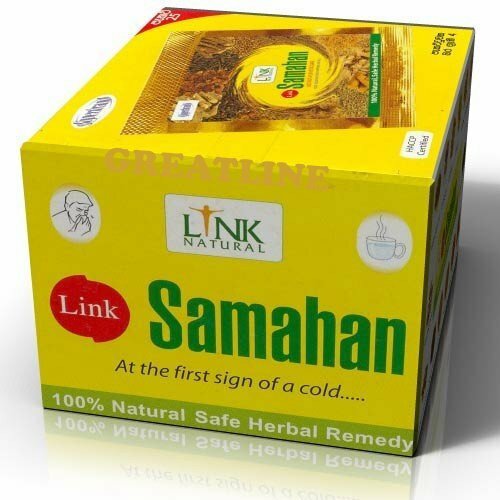 Link Samahan is presently the leading herbal product for colds and related symptoms in Sri Lanka and is fast becoming popular internationally. Ayurveda is a medical system that is in existence for over 5000 years and used by millions of people. Samahan formula was developed based on Ayurvedic principles and experience.The use of authentic raw materials of right quality and the scientifically optimized production protocol by Link Natural, make the Samahan effective and instant. Samahan is 100% natural. It contains only the ingredients mentioned in the pack and cane sugar. If you have any questions about this product by samahan, contact us by completing and submitting the form below. If you are looking for a specif part number, please include it with your message.